Lightweight and versatile for travel and outdoor painting in gouache, acrylic or watermixable oils. Taped to a board, the smooth, thin canvas has just enough texture to absorb paint and can be mounted later. Yes, is plate smooth using only the finest close weaved cotton and primed three times to a super smooth surface. The priming is the key. Imagine a canvas so versatile that it will accept any paint, ink or marker you have in your studio. Imagine the possibilities. You'll find this surface to be fantastic with virtually any acrylic based paint from heavy body to acrylic based inks to airbrush colors. Yes! Multi Media Cotton Canvas Pads is rated 4.8 out of 5 by 9. Rated 5 out of 5 by Doug from Great for color charts The 8-1/2" x 11" size is great for making color charts. I make up color charts, consisting of guidelines and text, on my computer, then print them out on a canvas sheet. The 8-1/2" x 11" sheets run smoothly through my ink jet printer and accept black ink lines and text well. I then fill in the guide with oil paint. When dry, I slide the sheet into an 8-1/2" x 11" plastic sheet protector which goes into a notebook. Rated 5 out of 5 by Bev from Versatile for travel and experimentation Lightweight and versatile for travel and outdoor painting in gouache, acrylic or watermixable oils. Taped to a board, the smooth, thin canvas has just enough texture to absorb paint and can be mounted later. The cost is low enough to feel free to try new methods and minimizes the problem of storage. Rated 4 out of 5 by Stephanie T. from Fantastic for Students on a Budget I use this for my painting I and II class and it works perfectly! Great for in class projects and studies for large scale works. I took apart the binding to get a whole sheet, one at a time, and tape them to foam core so I can paint on an easel. Definitely recommend if you want the feel of smooth gesso on canvas but don't have a lot of money or storage space for stretchers. 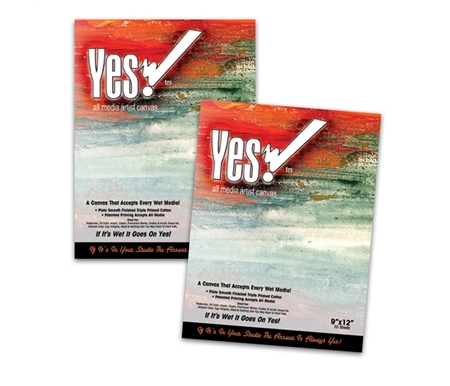 Rated 5 out of 5 by Corry from Nice Size and Nice Price The YES canvas pads attach easily to clip boards for student use. The canvas size fits great in large ziplock bags to take along with brush inside for outdoor art projects. Rated 4 out of 5 by Shelley from Great for ALMOST everything wet! I use these sheets for inkjet printing and they are not quite up to the job.The ink stays smudgible indefinitely.The product says suitable for any wet applicationand ink is wet.Great for oils and acrylics,though. Rated 5 out of 5 by playing with paint from I like it. Portable and good quality Easy to carry. Take a couple of clips along to mount sheets apart from pad. Works especially well when I do not want to be burdened by canvases. Handy also if I am teaching class and someone forgets their supplies. Can I use this in my inkjet printer? Thank you for contacting us. Yes, the 10 sheet Yes! canvas pads can be used for inkjet printing. You may want to look at the instruction manual for your inkjet printer to check the paper or canvas thickness that you can use in the printer before inserting the separated canvas sheets. Please let us know if you have any other questions or concerns. Will this work for Acrylic Fluid painting? You could tape down one of the sheets of canvas from the pad on a board and then paint with fluid acrylics on top of it. I would not recommend the canvas pad for acrylic pour paintings unless you plan to mount the canvas on a panel first. Please let us know if you have any other questions or concerns. If I paint on a 9x12 sheet, what is the best way to display the painting? Thank you for contacting us, Sharon. If you paint on one of the 9x12&quot; Yes! canvas sheets you could frame and mat that sheet behind glass or you could mount a sheet of the canvas onto a wooden panel before painting. You can also use the Yes! canvas sheets for painting practice or color swatches to keep in a sketch book or to pin to your studio wall. I hope that this information is helpful. Please let us know if you have any other questions or concerns.